Achieve interfacing speeds beyond twisted pair connectivity options (e.g. Camera Link) and get the convenience of video, power, command and control over just one low-cost coax cable. CoaXPress enables longer cable lengths (over 130 meters) and more robust connections compared other more expensive and less flexible digital interfaces. Experience the value of a perfect image. The QUARTZ series’ standard flat field correction and noise reduction functionality off‑loads processing needs on the frame grabber and simplifies the development effort at system integration. 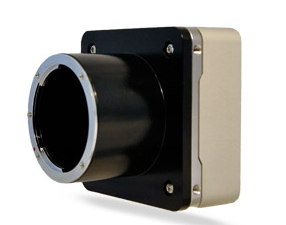 In addition to the sensors’ non-linear HDR (90dB) mode, the QUARTZ series HiQ feature enables capturing scenes with linear dynamic ranges up to 72 dB. This makes QUARTZ an ideal candidate to speed up existing CCD based solutions.